Let’s do 1st gear. A visual reveals badly worn dog teeth on our subject, so let’s remove the synchro parts, as we did on 2nd gear, and clean the parts. You will notice that the synchro components, brake band, anchor block and synchro ring, are unique to 1st speed. 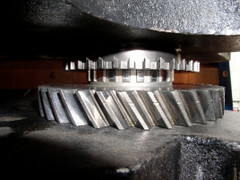 Only the retainer ring and the dimension of the installed synchro are shared with 2nd gear. 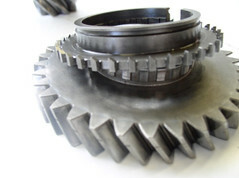 Note: Beginning with the 1977 version 915/61 transmission the 1st gear dog teeth are asymmetrical in shape, while earlier 915 versions are symmetrical and use a different sliding sleeve. Set up the special dog tooth ring removal tool, I use the factory tool along with a puller and a strong vise to do the removal. Even though a puller is designed to pull with equal force (a three jaw puller might be a better alternative than what I use, but I’m used to it), watch closely to be sure that the ring doesn’t get cocked to one side. 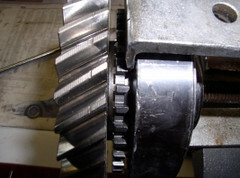 Once the dog teeth are off, clean the gear and set it on the press table. 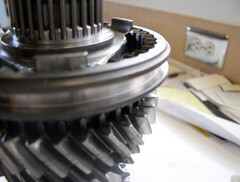 Place the new ring on the gear, wiggle it slightly, and you will feel it engage the splines on the gear. From that point, don’t touch the gear or dog teeth. I carefully lower a heavy steel plate onto the dog teeth ring without letting the ring move, and then lower the press’s shaft down to the plate. Don’t worry, the above picture is playing tricks, the dog teeth are perfectly “square” to the gear. 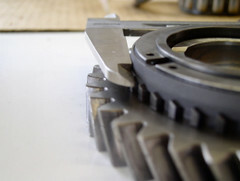 From that point simply activate the press, but watch your parts to be sure they stay aligned. If the ring gets off-center slightly, and get’s cocked over, the press can easily split the ring. At that point you will throw about $200 into the trash can. With the dog teeth installed, place your brake band, energizer block and anchor block in position, compress your synchro ring into the dog teeth and install the retainer. 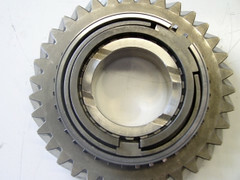 NOTE: The synchro ring for first gear is unique in that it has a groove in its two flat sides. 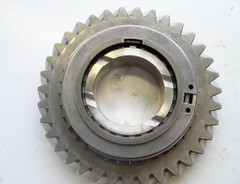 Early rings had the groove located closer to the middle of each side; late versions have the groove as pictured above. 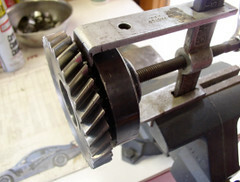 Be sure to rotate the retainer to the approximate position shown, placing the opening in the retainer away from the opening in the dog tooth ring and the opening in the synchro ring. 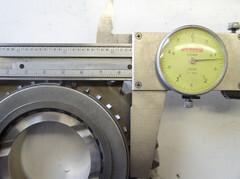 Measure the synchro ring. As we did with 2nd gear, rotate the synchro ring against its left and right stops, then position the ring near the middle of its range of movement. Clean the new sliding sleeve (it will probably be coated with a rust preventative such as Cosmoline) and the spider. If your transmission is apart because of a catastrophic synchro failure, it’s possible that one or more of the spider’s “teeth,” the guides for the sliding sleeve, are damaged or broken. If damage exists replacement is necessary. Slide the clean spider onto the pinion shaft, followed by the sliding sleeve, which will float on the spider. Did you notice that the teeth on one side of the spider are asymmetrical, the other side symmetrical? …but don’t consider that as gospel. Always check the teeth. 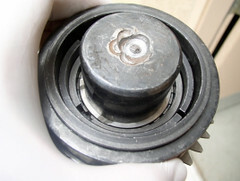 Slide the clean needle bearing bushing for 1st gear onto the pinion shaft, but only re-use it if its surface has a smooth, polished appearance. Follow that with a new needle bearing, and then 1st gear. 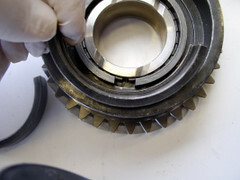 Install the thick spacer washer, and bearing part # 915 302 399 05 (superseded to # 999 110 029 00). 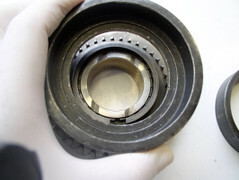 Bearing installation should be done in the press, and be sure that the bearing and washer are clean and dry. 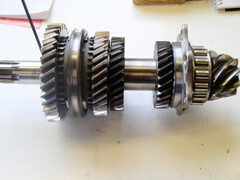 Congratulations, the pinion shaft is finished. Wrap it in clean paper, or a plastic grocery bag, and set it aside where no harm can come to it. 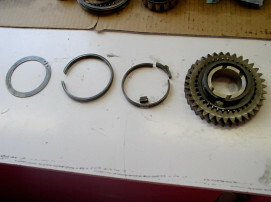 Two items worth mentioning, (1) the bearing is not on the pictured pinion shaft because at this writing I have not yet ordered it, and (2) if you have your bearing you should either install the bearing outer race into the center housing now, or put the race back in its package, label it, and put it with the pinion shaft assembly. I know that this part of the Tutorial is short, but part 5 (differential carrier bearing pre-load and ring and pinion backlash) will more than make up for it. Until next time, keep the shiny side up.